Last week the major financial news outlets shone the spotlight on a mid-May report from Fitch that raised major red flag warnings for those of you who have not been blinded by the markets. Fitch Ratings grimly reported that the debt levels over the past decade (since the end of the Global Financial Crisis of 2008/2009) have quadrupled. This massive increase in developing world debt has created a precarious situation for emerging markets as the financial conditions now begin to tighten up in the epoch of increasing American interest rates, the credit ratings analyst warned. It reminds you once again of why you need to protect and insure your investment and retirement portfolios alike with IRA-approved precious metals. Gold makes sense in an IRA because it has safeguarded true value over thousands of years in times of geopolitical, economic, and financial chaos and crises alike. Now is the time to review and understand the rules of Gold IRA rollover versus transfers while you still have a little time left. The stark raw numbers on developing nations' debt securities nowadays are astonishing. The total outstanding debt from such markets has risen from a mere $5 trillion ten years earlier to today's incredible $19 trillion. This makes it nearly the equal of the U.S. federal government's total debt at $21 trillion. Fitch warned in its report that borrowers in developing nations will be hampered by their rising external costs for borrowing, the resulting diminishing of capital inflows from the developed world, and a stronger dollar. This will be the base case even with local currency-based bond markets having developed apace over the past decade. These are grim consequences for the less wealthy over half of the world population just finally starting to climb out of the poverty trap. Because U.S. assets are set to provide substantially higher yields as a result of six more rate increases, U.S. and foreign developed capital market flows to the emerging markets' universe will likely diminish over the short to medium term time frame. For governments already severely challenged with refinancing their external debts or financing their present current account deficits, this will make life ever more difficult going forward. Fitch anticipates it will end with significantly lower valued EM currencies or possibly a substantial decline in the EM national foreign exchange reserves. Consider that this week the average local currency government debt yield touched its highest amount from March of 2017, per the Bloomberg Barclays indexes. In time, the repercussions of this will reverberate all though international markets on a scale that is hard to fathom at the moment. Naturally some nations of the world are most at risk of experiencing a devastating capital market outflow meltdown than others. The largest of these precarious EM markets are Turkey, Ukraine, and Argentina. Yet Fitch also spots upcoming potential danger in other markets that are substantially higher rated. This includes oil-rich powerhouses Qatar and the United Arab Emirates, energy exporting giant Kazakhstan, and Peru. These countries have in common their dangerous dependencies on externally funded debts. They assign China a more moderate medium level risk. Fitch reports that this comes down to their primary obstacles of higher debt levels throughout the overall Chinese economy as well as their mid-level bank liquidity circumstances. Countries like China that have developed their own local currency bond markets may avoid the worst effects of the outflows squeeze. These bonds are purchased mostly by important domestic investors and financial institutions. This includes local area insurance companies, pension funds, and banks. These deliver a solid and dependable source of funding for the bonds in local currency and on regional markets. As an example of the stability of these markets in the first five months of 2018, Fitch touts the fact that it has only witnessed a single default in the EM companies this year, that of Andrade Gutierrez SA, the enormous Brazilian construction firm. In 2017, Fitch recorded five such defaults. You might be forgiven for assuming that the U.S. stock market will weather the multiple interest rate increases over the second half of 2018 and all of 2019 as well as a decline (or even potentially worrisome crisis) in emerging markets on the back of the strength in its own economy these days (given both the tax cuts and enormous fiscal stimulus of government spending which are still contributing positive ongoing economic boosts). Even this is all relative though. Clearly when measured in the constant value metric of gold, the U.S. stock markets are merely at a similar point to where they were in the 1920's before the Great Depression wrecked markets for decades to come. The chart reveals that the all-time high in stock market valuation actually occurred not last year, but in the first years of the 2000's. This proved to be the point just before the Dot-Com bust destroyed the markets (and gold reached its multi-decade low point). What it means for you is that clearly you should not hold all of your base retirement assets in dollars. You may agree with this concept in principal, yet you do so unwittingly when you own solely stocks, bonds, mutual funds, real estate, or Exchange Traded Funds. All of these convert directly to dollars when you liquidate them. The moral of the story is that you need to add gold to your retirement portfolios and fast. It is important to realize that you do not have an unlimited supply of gold from which to make your purchases either. Just last Friday, gold expert Mike Maharrey discussed the dwindling supply of the kingpin of precious metals. Informed people believe that we are rapidly running out of gold. 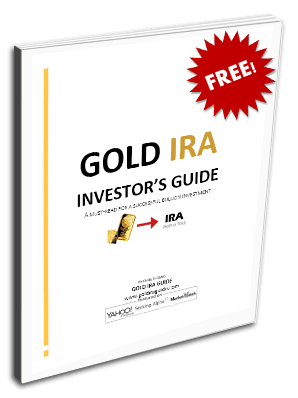 You can secure your share of IRA-approved gold now before investors begin to trample one another in their mad rush for the stock market exits. You might start with the top five gold coins for investors. It is easy to buy gold in monthly installments these days if you want to build up a significant position over time. If you fear keeping your retirement account treasure within the vulnerable to government seizure U.S. banking and depository system, the IRS will even let you hold your gold in top offshore storage locations for your Gold IRA nowadays.